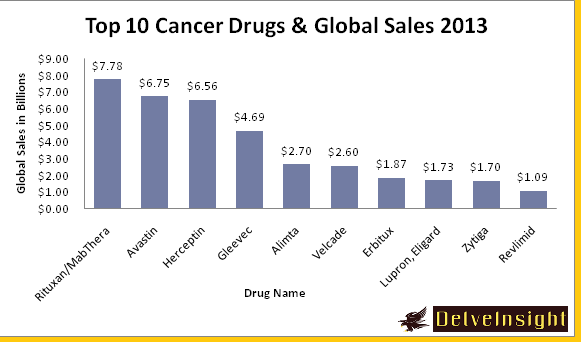 The industry’s 10 biggest-selling cancer drugs generated combined sales of $37.4billion in 2013, with Roche’s Rituxan, Avastin and Herceptin franchises extending their lead at the top of this league table. With combined sales of around $21 billion, these three drugs alone accounted for approximately 56 percent of the combined value of the 10 biggest-selling products. Rituxan is developed by Roche’s Genentech which is the first monoclonal antibody treatment for cancer. And even after 15 years on the market, it continues to see its sales grow, up 6% for Roche in 2013. The drug is also approved to treat a number of cancers, including non-Hodgkin’s lymphoma and chronic lymphocytic leukemia (CLL), it also works against rheumatoid arthritis and generates about $1.2 billion a year in that category. By comparing the sales of all the drugs the Roche company becomes the king of all the Pharmaceutical Companies involved in making oncology drugs. 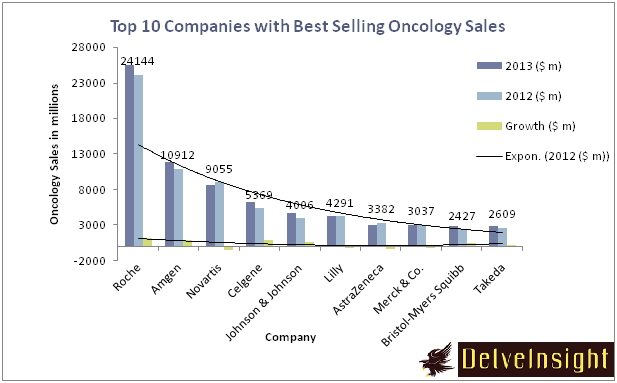 Let’s have a look over the ranking on the basis of oncology sales 2013. Roche has topped the ranking by its top selling drugs, followed by Amgen, Novartis, Celgene, Johnson and Johnson, Lily, Astrazeneca, Merck, BMS and Takeda. This entry was posted in Business Consultant and tagged AbbVie, Alimta, Avastin, Best Selling Oncology Drugs, Bristol-Myers Squibb, Celgene, Eli Lilly, Eligard, Erbitux, Gleevec, Herceptin, Johnson & Johnson, Lupron, Merck, Novartis, Pharmstandard, Revlimid, Rituxan/MabThera, Roche, Taked, Takeda, Top 10 Comapnies oncology, Top 10 Oncology Drugs, Velcade, Zytiga.